Welcome to Jenny Perdue biography. Jenny Jo Perdue has always had music in her blood. To begin with, she was born in Music City, U.S.A.  Nashville, Tennessee on December 06, 1988. She began performing on stage with her father Harvey Perdue when she was just three years old. The first song she performed on stage was "Let the Sunshine In." By the time Jenny Jo was six, her parents went on the road and Jenny and her dad did 135 concerts for the year 1995. Not long after that at the ripe old age of seven, Jenny recorded her first song in Nashville, which was titled "Paper Dolls." It was released and received worldwide airplay, especially in Australia and Germany. It was also released on the German Country Music Association's Compilation Disc as one of the Top 20 songs in 1998 for Independent Country. "Paper Dolls" is available on Jenny's four song mini-album, "Pretty World, Pretty Girl" and the "God and Life" album which can be purchased through the Rock of Ages Songs Web site. "If My Heart Had Windows" was released in 2002 by Midland Records Company to the Independent Country Market. In 1999, Jenny decided to take a little break from singing to try her hand as a musician. Her instrument of choice was drums. In 2001, when her family moved to Hot Springs, Arkansas to start the Cowboy Church of Hot Springs, Jenny was immediately chosen to be the staff drummer for the show. In 2003, Jenny decided to learn to play the bass guitar, and in 2004, Jenny went back as a full time singer, and learned how to play the guitar. As as an artist, she has shared the stage with legends such as Pretty Miss Norma Jean, Bobby G. Rice, Razzy Bailey, George Hamilton IV, Gary S. Paxton, Billy Walker, Carol Lee Cooper, Wilma Lee Cooper, and Gospel great Ronnie Hinson. Jenny also performed for The Lions' Club of El Dorado, Arkansas, The Masonic Lodge of Little Rock, The Lions' Club of Van Buren, Arkansas, The Arkansas Fraternal Order of Police in Mountain Home, Arkansas, The Make-a-Wish Foundation of Arkansas, The Bar Fifty Ranch St. Jude Children's Research Hospital Fund Raiser (2 years), and the 2005 and 2006 Spa Blast as the Oaklawn Race Track with more than 25,000 each year in attendance. Jenny has met numerous singers and celebrities such as Ferlin Husky, President Bill Clinton, Vice President Al Gore, Tennessee Governor Ned Ray McWherter, George Jones, Jeff Bates, Sawyer Brown, Jay Bush and Duke, Brad Paisley, Chely Wright, Donna Fargo, Freddie Hart, John Conlee, Freddy Fender, Ramona Jones, Skeeter Davis, Charlie Louvin, Little Jimmy Dickens, The Oak Ridge Boys, The Four Guys, Hot Apple Pie, Roy Clark, Joanne Cash (Yates), Paul Overstreet, Dolly Parton, Sammy Kershaw, Jim Ed Brown, Miranda Lambert, Aaron Tippin, Alan Jackson, and Pam Tillis just to name a few. In 2005, she decided to start doing some songwriting. She wrote a song called "Honeybee" in January of that year, and "Everyday" in February of the same year. Jenny was honored to perform with her father at the Holiday Inn Plaza during CMA Music Fest Week 2005 to showcase her music. Jenny was also a featured artist on The Round-Up TV Pilot and is currently featured on The Round-Up Shortwave Radio Broadcast which to goes to 210 million homes on WWCR Saturday Mornings at 12.160 MHZ at 9 AM. She was featured in 2005 with her father and Ernest Tubb on "The Voice of Taipei" from Taiwan with host Michael Tao. She has had several award nominations and has some awards under her belt which include Sweetheart of the Year 2002, Young Musician of the Year 2002, Star of Tomorrow 2003, and Female Vocalist of the Year 2003. Currently, Jenny has just finished her first ten song album in Nashville. The album, titled "Cadillac Blood" (which includes "Honeybee and "Everyday") is right now being pitched to the major labels of Nashville and is not yet available to the public. She is also a weekly performer on the Cowboy Church of Hot Springs and has performed on more than 600 professional shows in the last four years. To top it all off, one of her trademarks of the stage is a 170th year Anniversary C.F. Martin and Company Hawaiian X guitar, of which there are only 500 of in the world. This was Jenny's first real guitar which she worked for and bought herself. She continues to perform with heart and soul, and is a real inspiration to her fans and audience. 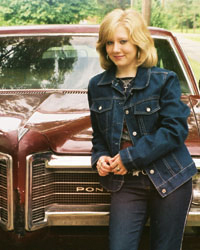 Jenny Jo Perdue is a true Country Music star in the making.